Earlier this year, in the fourth Process Art class that I attended, we were required to do a collage using pictures from magazines. We started off (with the help of a guided meditation) by writing about a memory from our childhood to do with a book or story that someone had read to us or told us. Mine was 'Goldilocks and the Three Bears'. I used to have a recurring bad dream about that story when I was little. In my dream the bears were at our front gate, coming for me, and I had nowhere to hide and nowhere to run to. I felt such fear of getting into trouble for doing something I'd been told not to do. We paged through magazines and tore out pictures that caught out attention and resonated with us, not necessarily pictures that illustrated the story. I was never a huge fan of collage work and found it hard to get into. I did not enjoy the class that much. I was also disappointed with my work at the end of the lesson. In those early days of Process Art classes I was still hung up on the final artwork or end result and hadn't quite got into the 'process' yet. 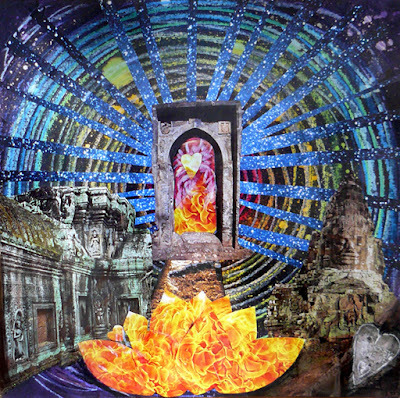 The collage that I did in one of the first Process Art classes. A month later, we did another collage. This time we started with wax crayons, inks and bleach before paging through the magazines and tearing out pictures to paste onto our work. Amazingly, I thoroughly enjoyed myself. I was completely unconcerned about what the end result would look like. I was actually humming happily (but very quietly) while I worked. I was surprised at the end result but this time did not focus on it as an 'artwork' or place any judgement or criticism onto it. The collage that I did a month after the first collage. At the end of that term we were given all our work back in a large brown folder. I laid my work out on the floor to get a good look at what I had achieved and it immediately struck me that these two collages had strong similarities. All the work done during the first term of my Process Art classes. 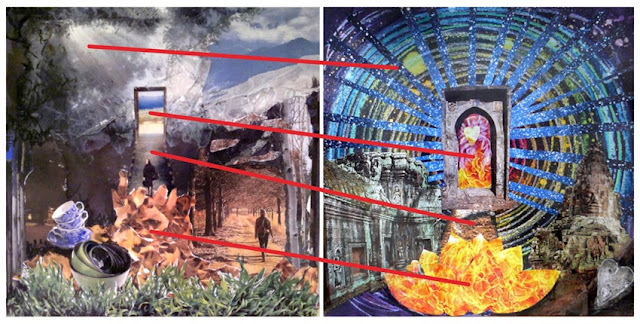 Both collages have a path leading to an open doorway positioned more or less in the middle of the picture. 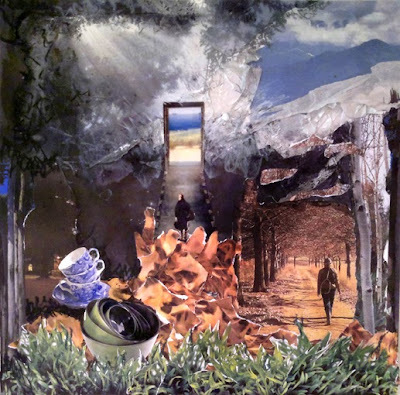 At the start of the pathway in the first collage, is a jumble of torn pieces from a picture of dried autumn leaves. They look a lot like flames. 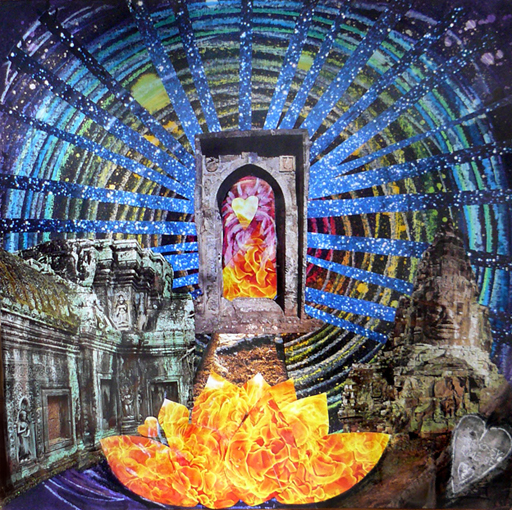 In the second collage there is the shape of a lotus flower made up of petals cut from a picture of flames. In the first there are rays of light coming into the picture and in the second there are rays going out from the centre of the page. While doing the first collage I felt stuck, frustrated and irritable. While doing the second one I felt free and full of joy! I can read a lot more into both of these works, but for me the most exciting thing is the idea (or even the proof) that my subconscious is hard at work during these Process Art classes. A friend asked me what it is that I gain from doing these classes. What 'therapy' am I getting from them? I think what it is, is that I'm giving my subconscious a voice. A bit like analysing ones dreams? A way to feel connected to something greater.